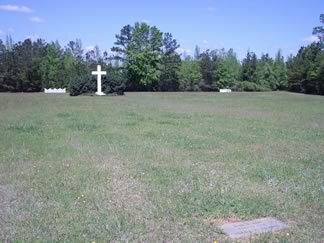 Also known as Jasmine Ridge Cemetery. Surveyed Apr 14, 2005. [Inquire at Central State Hospital to obtain access and the key to the gate to the cemetery.] From the Baldwin County Courthouse, go east on Hancock St. one block. Turn right (south) on Wayne St., which becomes Business 441S. Follow Business 441S for approximately 4 miles to the intersection of Hwys 441 and 243. Turn left on Hwy 441 S and go approximately 0.4 mile to Carl Vinson Rd on left. Turn left and go approximately 0.3 mile until Laying Farm Road is on your left. Turn left and go approximately 0.1 mile to Baldwin State Prison on your left. Go into the prison and bear left to the maintenance building. The driveway begins at the maintenance building. 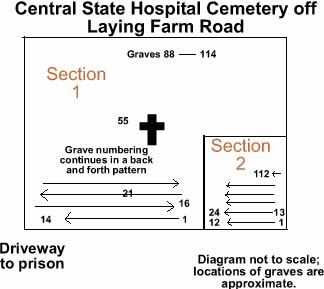 Follow the driveway for approximately 0.4 mile to the cemetery. Alternate directions: after turning left on Hwy 441 S. as described above, go approximately 0.3 mile. Turn left on Lilac Drive. Go 0.3 mile to its dead end into Lilac Court. Turn left on Lilac Court and go less than 0.1 mile to its end. Park. 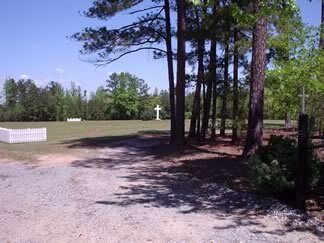 Walk to your right about 100 feet to the driveway to the cemetery. Follow the driveway to the left for approximately 0.2 mile. Possibly a marker or a section marker numbered 1. Markers O1, O3 through O6. Marker appears to be displaced. Markers 15G5, 15G6, 15G7, and 15G8. Open area. No visible graves. Born Bradford County, Florida. Died Milledgeville, Baldwin County, Georgia. Buried in P/2. All info from her grandniece Diane Kuznik. Found on CSH grounds Dec 28, 1976, buried Jun 10, 1999.